James A. Aitken was the son of John Aitken, a “temperance” coffee house keeper who lived in Edinburgh and Glasgow. James Aitken lived in Glasgow and the Isle of Man. He died at the age of 51 from Bright’s Disease. 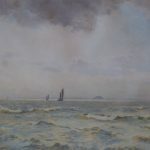 He exhibited at the Royal Academy and the Royal Scottish Academy plus was a member of the Royal Hibernian Academy and the Royal Scottish Society of Painters in Water Colours at different times.